It was a FANTASTIC Running weekend in Tall Mom land... Before I get into what I did... I must share the happenings of our Bloggy Buddies. CONGRATS to Marlene HERE Half Marathon PR! CONGRATS to TMB HERE 60 mile training week PR! CONGRATS to Amanda HERE for reaching her 1st Fundraising Goal. Inspiration all around!! Way to go ladies. A few of my running buddies were busy Saturday but thankfully Tammy AKA Red was able to meet up. I was worried I would not be able to keep up with Tammy so I texted her that I was hoping for sub 9:00 Pace, she agreed. We started well before the Bonney Lake Fleet Feet group since we would be running for over 3 hours. Sidebar: Our Little Studs have ESP when it comes to knowing when Mommy NEEDS a good night of rest. The night before my run LS#1 had a sippy cup leaky mess at 2:30, took me 20 minutes to flip the sheets and him. Then at 3:45 he had a bad dream and at 5:05 LS#2 cried out for a drink.. UGH!! I was worried that the interupted sleep would hurt my run. Fast forward to 7AM I used the facilities at the Meeker Trailhead Foothills trail talked with a couple runners and we set out. I was nervous for the run but I knew running and chatting with Tammy would be GREAT as always. Not much to report. It was about 42' at the start, very comfortable, no rain, no wind. BLESSED!! We saw 2 Bald Eagles one felw over the trail just before we hit half way, it was MAJESTIC. Is anyone else a Running Bird watcher?? On the return trip it is a little downhill which helps the legs turnover faster. We had a pit stop with 7 miles to go, and ZOOMED to a speedy finish. I was in short sleeves by the end. SUPER proud of a 8:52 average pace, right where I want to be this close to BOSTON!! We were limited on time this morning so we could not meet up with Kerrie and Zoe :( On my way to the South Prairie Trailhead Foothills trail to meet Amy I saw Paul HERE, the Owner of Bonney Lake Fleet Feet, and his FAST buddies on the shoulder. I knew they would catch up to us soon. 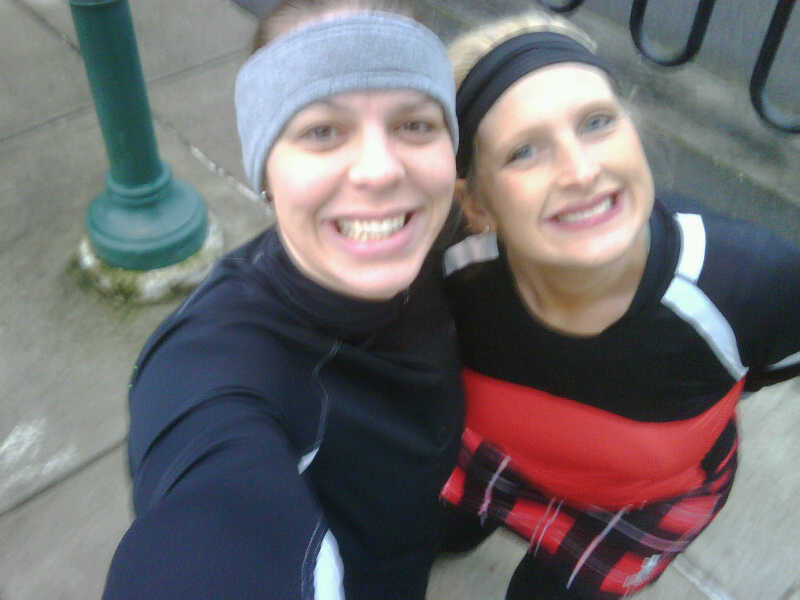 Amy and I snapped a fun photo, she had her new Brooks shirt and cute running skirt. Yes we are the same height!! Tall Moms on the run for sure.. The weather was perfect and Amy was speedy. Generally we have been in the 10+ pace but WOW she was 9:20 for a good amount of time. Thankfully my legs were not sore or tired from the 22 miler, just my feet and arches, I was able to keep the pace. Eventually Paul and his 5 fasties past us as fast as bikers, they ran 7:14 pace for 21 miles!!!! Paul is poised for a sub 3:00 performance in Boston. GO PAUL!! Bikers with smiles and chants "On your left"
It was ENJOYABLE! We talked and talked, our friendship growing with each stride. Don't hate me for saying this BUT I almost forgot I was running. Poor Amy was feeling the affects of going out too fast and said "Whooo" a few times, it made me laugh. She asked if I was tired, "No I feel really good." I did, I felt GREAT! Another weekend with 30 miles, and I KNOW this is the best training I can possibly be doing right now. Can I get a YIPPEE?? Please share any POSITIVE running stories, I would love to hear them!! Woohoo! So glad you are finding your "stride" again! I had an awesome 14 miles with Zoe and Alma was with us for 5 of them. Zoe and I were cruisin'! Missed you guys, but we'll see you soon. OH! And we saw one bald eagle, two Canadian geese (which Zoe protected me from) and one great blue heron flying! My baby does the same thing with having a bad night whenever I really need the rest! Some Positive Thoughts... Saturday did a Half with my Daughter, her best freind and my sister-in-law. It was my Sister in laws First Half. It was the Snake River Half just outside of Pullman. We woke up to a rain/snow mix in Moscow(I am a Vandal) but when we got to the start line the weather was awesome. Amber and I are normally very slow. Our normal times are about 3 hours for a half and 6 for full. ANYWAY... we finished... I in 2:30 hours... and my daughter is 2:45. I live in Wisconsin and have been doing my runs inside on the treadmill. I am not a cold weather runner. But, right now it is 30 degrees outside and I am so ready for Spring to come that I decided to take it outside today. 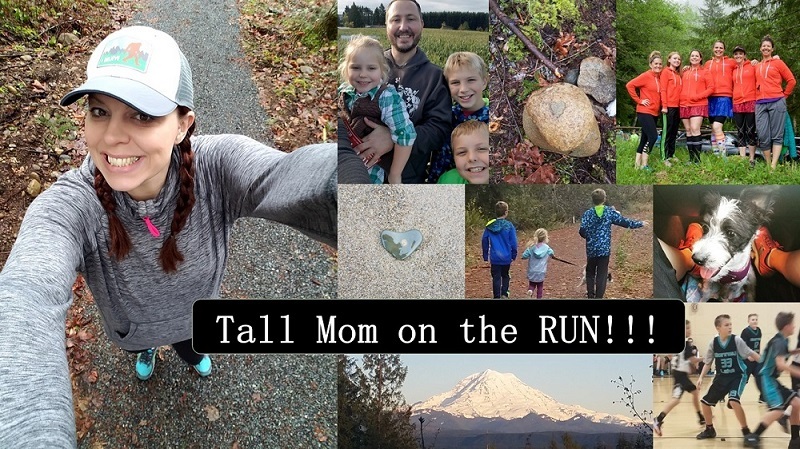 I stopped by your blog to get a little pre-run inspiration. Glad you had a great running weekend. Congrats on two strong runs this weekend!! That is some big mileage. And WOW to speedy Paul! So glad you're feeling better about the training girl! Congrats on a great week! 6 more til I see you! woot! Yes! You can get a YIPPEE!! Your post was a big smiley face all around! Yippee! You are so inspiring! Thank you, thank you! I actually saw you at the Meeker trailhead Saturday after the run but I was in a hurry to get home (husband due home after a weeklong work trip), so I didn't introduce myself. Next time I will make the time! Wooo hoo! Awesome weekend for you! I'm STILL recovering from my first full marathon in January (and having some hip probs that I'm in PT for). I was happy to do ONE lap around Green Lake yesterday morning, a far cry from the 20 milers just a few months ago. :( I think I'm going to come out of this a lot stronger as a runner. The only running I did this weekend was sprinting from base to base in our family's epic weekend wiffle ball game, but it was AWESOME. It sounds like you are really reconnecting with you and the runner you are! That's awesome! You are so on track for Boston!!! This weekend ran a mock 13.1 to see what I had to work on for my race in 2 weeks...just about on track! YIPEE! WOW! Only 42 days till I SEE YOU??? Way to go on your training lady... you rock it out! I hope you're not still having any doubts about Boston cause lady, you are going to rock it! CAN'T WAIT to see you again. When you posted the other day that we've met once...I had to stop and think about it. It feels like so much more! AWESOME. So glad it's clicking again! I ran my first 18 miler this weekend. Spent 10 miles on our singletrack (and boy, oh, boy...talk about fallen trees after the tornadoes last weekend!) and the last 8 miles on paved trails. It was so hard, and I'm so glad that I've hooked up with a local running club. It's making all the difference to have some running friends with whom to share these runs and keep me running when I'd like to crawl. my husband and I (oh and Evie in the BOB) tackled 7 miles on Sunday. The weather was perfect for running. I ran my first 5K this weekend! It was amazing! 10 minute mile, slow by running standards but I am happy with it. The race adrenaline is FABULOUS and I'm addicted!!!!! A 30 mile weekend isn't too shabby. Sounds like you're ready for a marathon. Your "blog voice" sounds so much like YOU compared to maybe a month ago! AWESOME!!! And funny about the birdwatching comment, I have been birdwatching as of late...but no majestic bald eagles...bummer. Miss them!!! Thanks for the fundraising shout out!! Your the Heat! Your blog inspires me. Thanks for sharing with us your experiences about your runs. I am in AWE over how you can run 30 miles in two days!! !